Given the tiny size of coccolithophores, it is difficult to get a good look at them. The best way is using a scanning electron microscope (SEM), which shoots electrons at an object and constructs the image based on how they reflect back. While we can only take images in black and white, SEM technology allows us to see things at a level of detail that would be impossible with a traditional light microscope. 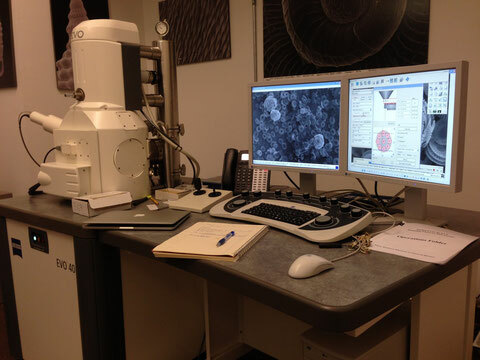 Below is a picture of the SEM that I am using at the Santa Barbara Museum of Natural History. SEM enables me to take pictures of particles that are 1 µm long, such as coccoliths. To give you some context, the thickness of a single human hair is 17 to 181 µm. 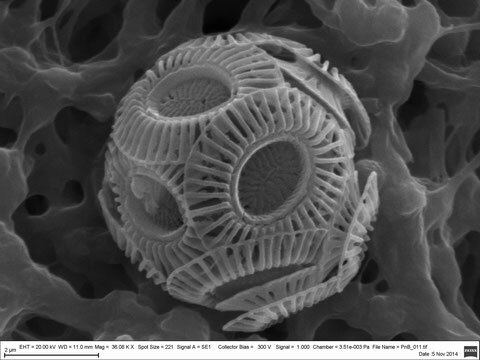 Below is an image of the coccolithophore Emiliania huxleyi that I took on this instrument. Hi, i think that i noticed you visited my web site so i came to return the desire?.I am trying to in finding things to improve my website!I assume its ok to use some of your ideas!! I am extremely impressed with your writing skills and also with the layout on your blog. Is this a paid theme or did you modify it yourself? Anyway keep up the excellent quality writing, it's rare to see a nice blog like this one these days. I love what you guys are up too. Such clever work and coverage! Keep up the amazing works guys I've included you guys to my blogroll.